As usual, I left home at 4:30 AM to make the three hour drive to Crawford Notch. The weather was cold, but nice and sunny, with no chance of snow or rain. After stopping briefly at the Highland Center, I headed across the windswept field to the start of the Avalon Trail behind the Crawford Depot. 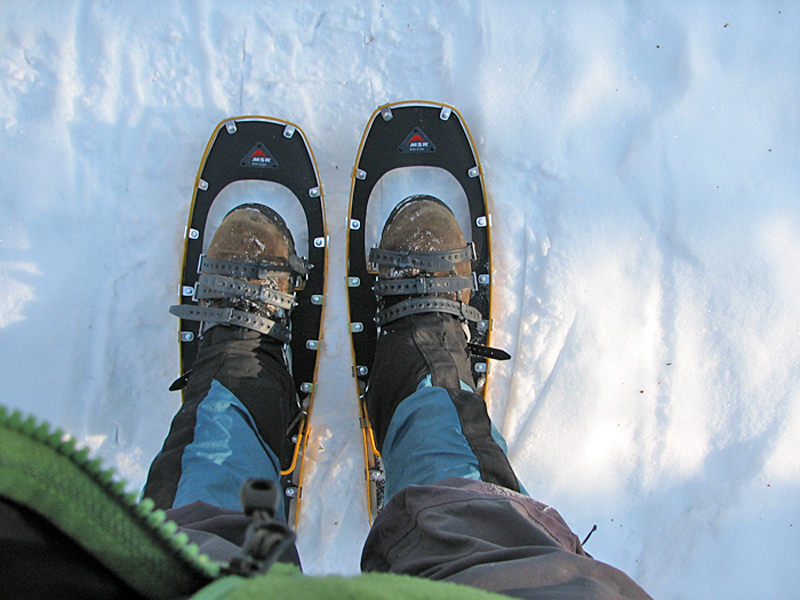 After losing a snowshoe on Cannon Mtn in 2011, I decided to buy a pair of MSR's newest snowshoes, the Lightning Ascent, so part of the purpose of my hike was to test them out on a familiar, and not too challenging trail. This section of the trail was fairly flat and wide, and the center was nicely packed, but even here, I was quick to feel the difference from my old 22-inch MSR Denali Ascents and the 25-inch Lightning Ascents. The mere 3-inch difference was quite noticeable, and it took a little practice to keep the tails from crossing as I naturally walk with my toes slightly pointing out to the sides. About a half mile in, at a crossing of Crawford Book, while I had stopped to take a picture, a large dog-like animal suddenly rounded the corner and headed right toward me. At first I thought it was someone's dog, but considering that nobody else seemed to be around, and that I had just read a trip report about some aggressive coyotes, I decided that it must be a coyote. I told it to stay back and it backed off for a moment, but then started to approach me again. I got my poles ready to defend myself. Finally, after a minute or two of indecision, a man came up the trail and called to it. So it was a dog after all! I told him that I had thought that it might be a coyote and he acknowledged that others had made the same mistake. I let him and his dog pass me and went back to taking a couple more pictures before continuing on. Back on the trail again, everything went smoothly until I reached Suicide Gulch. Suicide Gulch, which I had dubbed this steep-walled ravine just beyond the Avalon and A-Z Trail junction, was a term I had borrowed from Calvin and Hobbes, a name that Calvin had given to a unnaturally steep tree-studded toboggan hill where he and Hobbes regularly risked their lives in death-defying runs (just for the record, he also called it Dismemberment Gorge at times). Suicide Gulch. 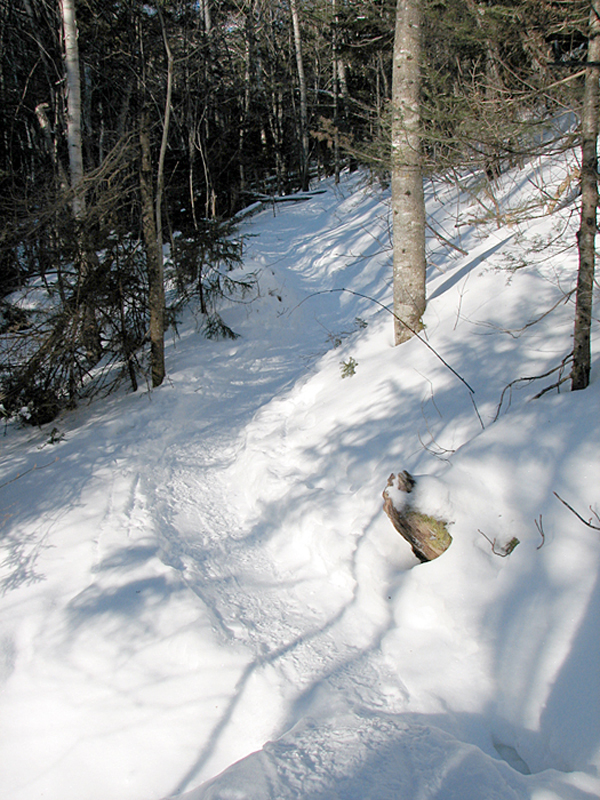 Even the best snowshoes seem to turn into skis when you're descending its precipitously plunging sides. The last time I was here in the winter, this had actually happened; I slid about twenty feet before stopping myself, but not before losing a pole, which went careening somewhere down into its bottomless depths. Actually, since I was prepared for disaster this time, I made it safely down and then up the other side again, but only because I was extremely careful. Crossing my tails here could have been disasterous. 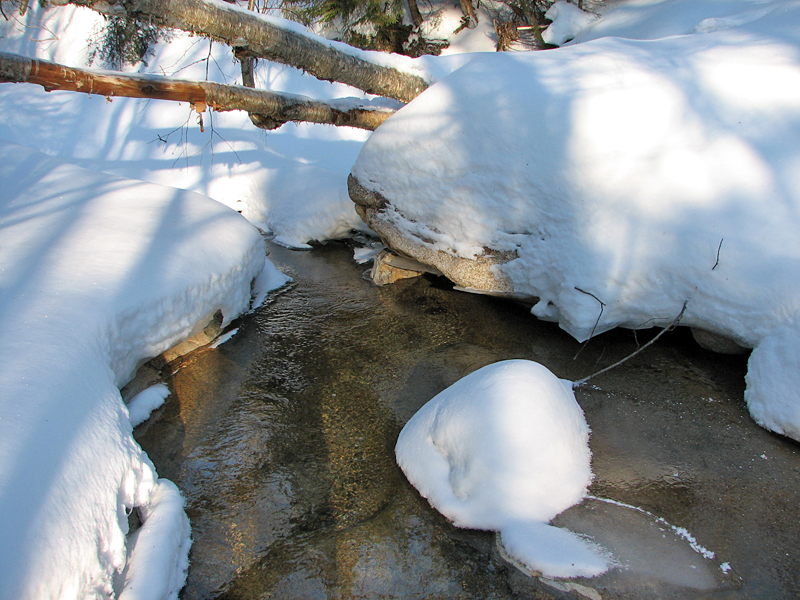 In the slickest spots, I found it safer to avoid the packed portion of the trail and opt for the greater traction of the deeper unbroken snow to its side. 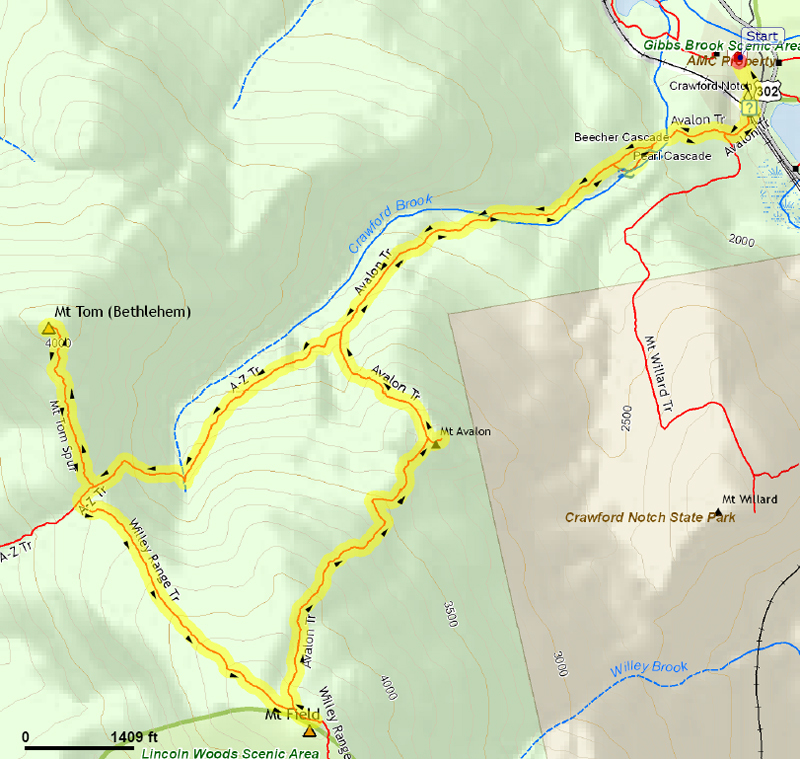 The rest of the way up to Mt Tom was uneventful, but by the time I got there, I was hungry and ready for lunch. The winter sun was beginning to melt the ice on the branches of the numerous fir and spruce trees that dotted the summit area, and without a breeze, I wasn't at all cold. But I had brought my stove and some chicken noodle soup, so I found a good spot, heated some water, and made my lunch. 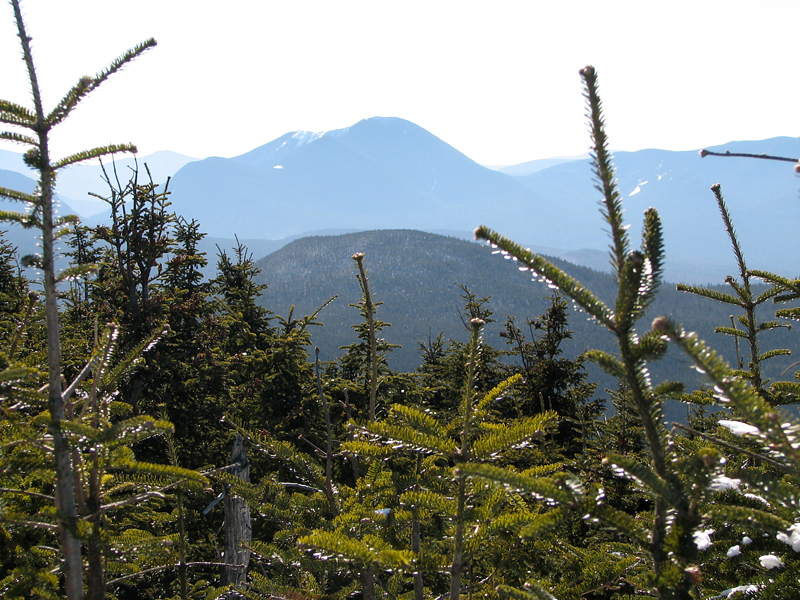 But what does one commonly see at higher elevations below treeline in the White Mountains when there is even the slightest hint of food around? Gray jays, of course. So, while I was eating, I gave one persistent bird a couple of noodles, which kept him still on the ground long enough for me to take a good picture. Crawford Center. 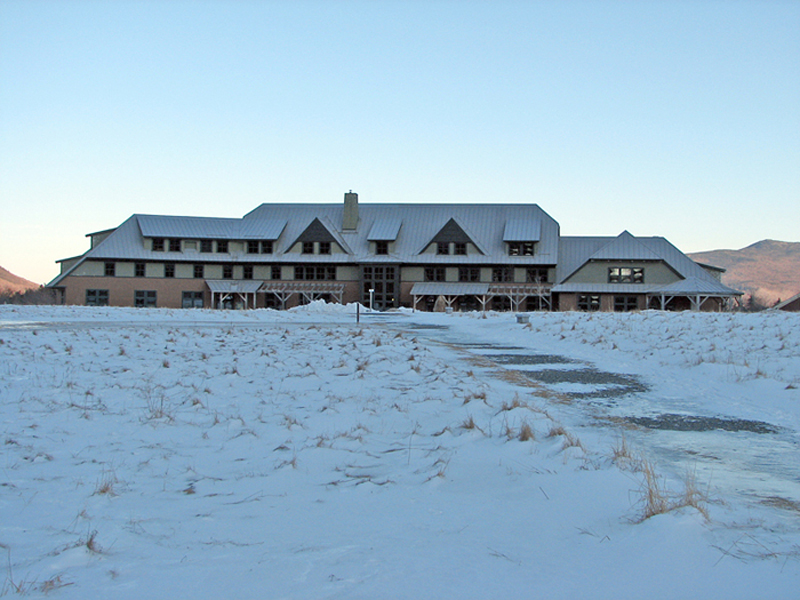 In the winter wind, it's a long cold walk across the open field from the Crawford Center to the Avalon Trailhead. Trailhead sign. The Avalon Trail begins directly across the railroad tracks from the Crawford Depot. 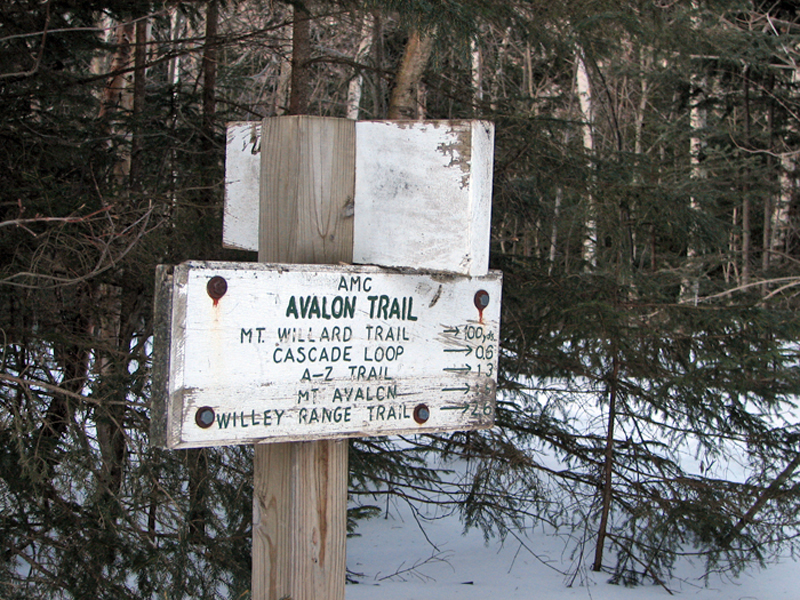 Avalon Trail. The lower section of this trail is fairly flat and wide. After passing the Cascade Loop junction, the trail narrows and begins winding its way up a moderate slope. My new snowshoes. After losing a snowshoe on Cannon Mtn in 2011, I decided to buy a pair of MSR's newest snowshoe, the Lightning Ascent. Brook crossing. About a half mile from the trailhead, the Avalon trail crosses over to the other side of Crawford Brook. Suicide Gulch. Just after the Avalon Trail turns sharp left, the A-Z Trail crosses a steep-walled ravine that I dubbed "Suicide Gulch." 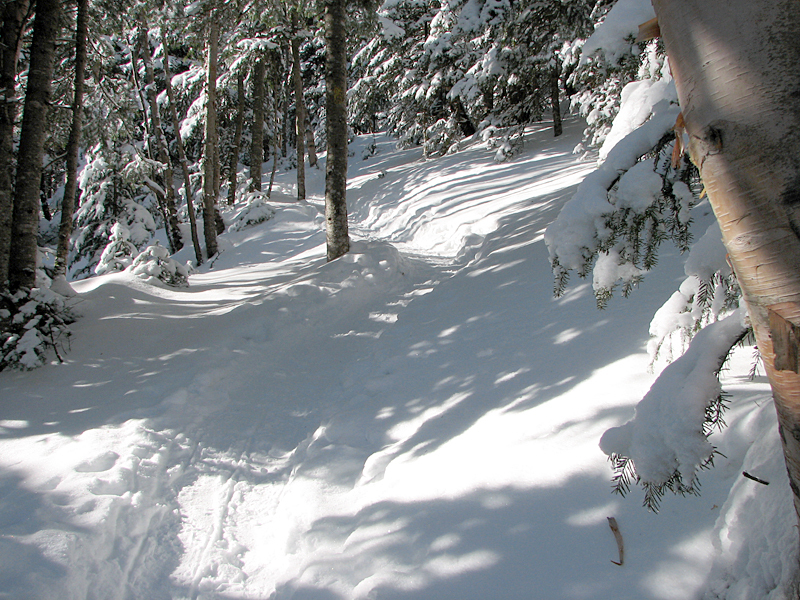 Even the best snowshoes seem to turn into skis when you're descending here. Mt Tom Spur. 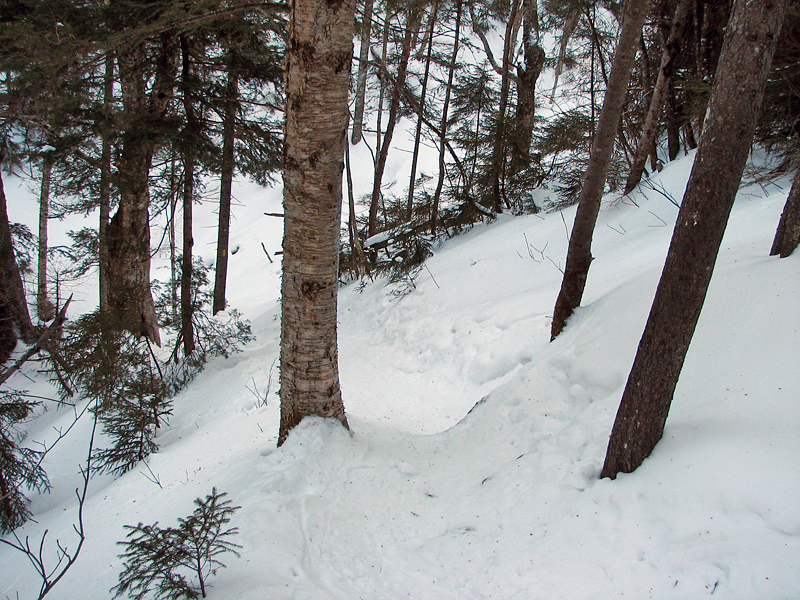 This short side trail to Mt Tom begins nearly level, and then switchbacks up the steep portion of the summit cone. 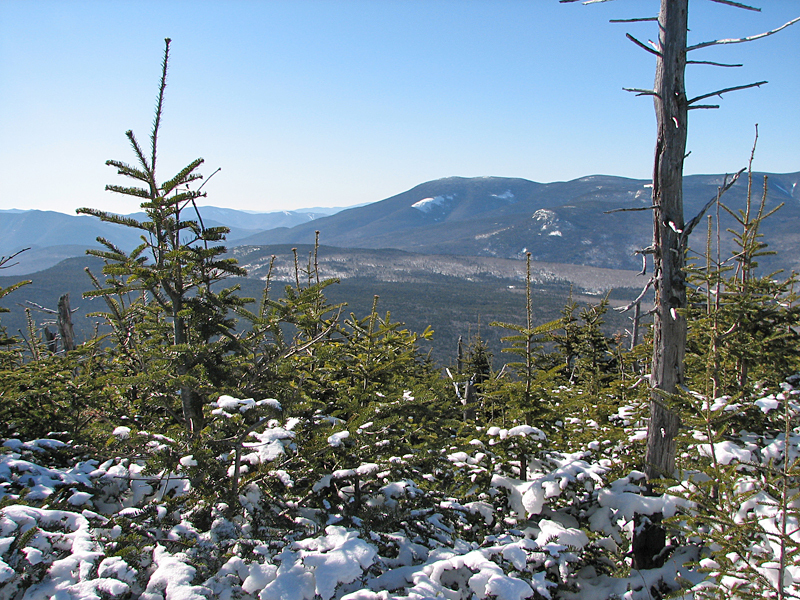 Pemigewasset Wilderness and the Bonds. The west-facing summit overlook gives a few decent view to the west and south. A somewhat hazy view of Mt Carrigain. By lunchtime, the winter sun was beginning to melt the ice on the tree branches. Gray jay. 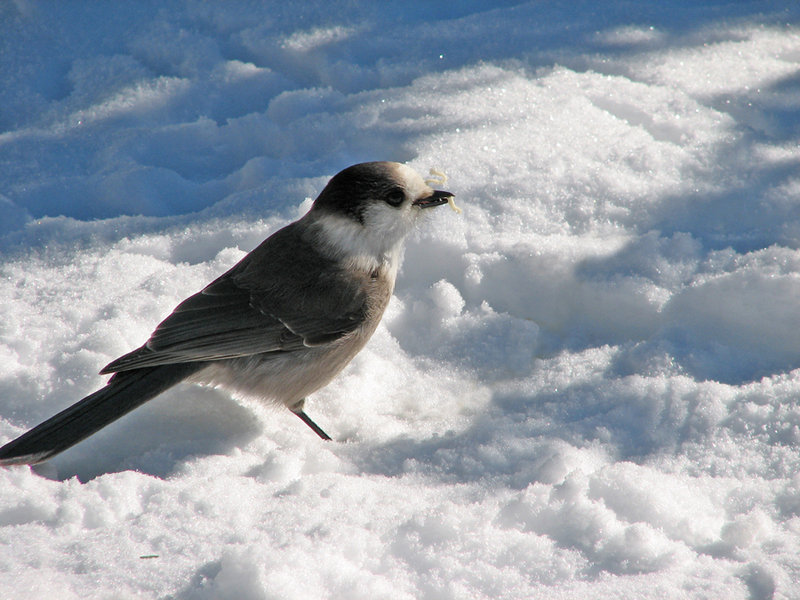 I gave a hungry gray jay a couple of noodles from the soup that I made for my lunch.